Religious Place of Worship Research Papers discuss a personal experience of a Roman Catholic Church, with details of the building and sermon. This past Sunday, I attended Mass at St. Thomas Roman Catholic Church. As I had never attended a Catholic Mass, I was unsure of what to expect. I was surprised to discover that the Mass itself was very ritualized, with a formality that does not always occur in some Protestant denominations. Along with a highly decorated worship space, the church building, it created a total atmosphere of religiosity. It was difficult, at first, to pick out what the central theme of this worship service was. It was announced that it was a Sunday in “ordinary time,” a term I concluded to mean that this was a regular Sunday, and not a special event (such as Easter or Christmas). However, several clear themes about God emerged. First was the idea that God is good and loving. The opening song was called “Sing a New Song Unto the Lord,” and the words were joyous in the mutual love between God and man. The scripture readings were all built around a central theme, which was explicitly expounded upon by the priest during his sermon. Far from the stereotypical idea that Catholics think people are bad, the idea was implicit that men are sinful, true, but capable of doing good and receiving God’s love. I found that theories tended to disappear from my mind during the service, as my senses were filled with concrete ideas about the Holy. What I mean by this is that the church was replete with religious symbols, and the ritualization of the Mass created a powerful emotional experience for me, one that transcended theoretical ideas. Religious symbols were everywhere in this church: on the walls, the ceiling, and the windows. Central to the eye was an enormous crucifix above the altar. Unlike Protestants, who only display the cross, Catholics depict Christ crucified on the cross. I was reminded of Mel Gibson’s film, The Passion of the Christ, on that sought to understand Christ’s sufferings by visibly depicting them. (I read that Gibson belongs to a conservative Catholic sect.) In addition to the crucifix, the windows were made of stained glass, and depicted the Stations of the Cross, twelve events of Christ’s passion and crucifixion. Modern Priest Looks At His Outdated Church - A Modern Priest Looks At His Outdated Church research papers look at a book that examines the human impact of the legalism of the Catholic Church. Separation of Church and State - The American experiment in the separation of church and state and religious tolerance has, in fact, been a singular success. 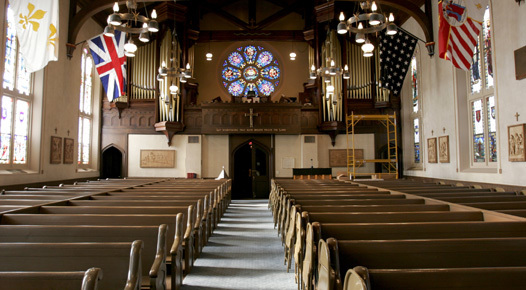 Episcopal Church - Episcopal Church research papers explore the history of the Anglican Church, Anglicanism and Christ's role in the church. The Unity Church - The Unity Church Research Papers examine this church denomination based on the New Thought Movement that was founded by Charles and Myrtle Fillmore. Paper Masters writes custom research papers on Religious Place of Worship and discuss a personal experience of a Roman Catholic Church, with details of the building and sermon.